Individuals searching for high quality contact lens solutions may want to consider ACUVUE OASYS lenses. 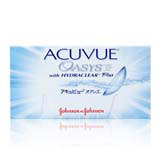 Ranked the #1 physician's choice in the US, ACUVUE OASYS is a popular brand used by millions of people across the world. It offers many of the key features that have grown to become synonymous with the ACUVUE family; quality UV protection, superior comfort and high performance. ACUVUE OASYS lenses can be ordered online and are delivered anywhere in Australia. OXYGEN RICH DESIGN: The ACUVUE OASYS lens is manufactured out of a unique silicone hydrogel that allows the eye to receive over 80 % of the available oxygen. The constant flow of oxygen is necessary for healthy vision. It reduces the rate at which protein deposits build up and ensures that wearers are able to enjoy a comfortable experience even when worn for long hours. SMOOTH LENS: ACUVUE's HYDROCLEAR technology results in an ultra smooth lens surface that is more resistant to the presence of dirt and protein deposits. The ultra smooth surface also enhances the comfort of wearing the lens making it almost unnoticeable to the wearer. BLINK STABLIZED DESIGN: Even with frequent blinking, the ACUVUE OASYS lens remains in place. Unlike older models which are affected by blinking and rapid eye rotation/movement, the OASYS lens is designed to naturally realign itself in place when shifted ensuring that the wearer is always able to retain clear focus on near and distance objects. SUPERIOR COMFORT: At the heart of the ACUVUE OASYS lens is the comfort that it offers. The lens features the brand's patented HYDROCLEAR Plus technology which enhances the transmission of oxygen to the eye. This increased oxygen permeability reduces the risk of eye soreness and results in comfortable wearing experience, even during extended use. UV PROTECTION: Keep your eyes protected from the harmful UV-A and UV-B rays of the sun. ACUVUE OASYS lens are fitted with filtering action that are strong enough to block out 99% of residual UV-B radiation and as much as 95% of ambient UV-A. Its strong UV filtration properties are however not intended to serve as a substitute for UV protective eyewear. Test and certified by the highest regulatory bodies including the FDA. The lens' Smooth surface and built-in hydrophilic material creates a wet and comfortable wearing experience that feels natural even during extended use. Suitable as a corrective option for people diagnosed with ocular issues such as astigmatism or myopia. Eye injury, abnormality or disease that affects the eyelids or cornea. Severe eye inflammation or infection of the eye. Known history of allergies to the materials found in contact lenses or the materials used in the lens care solution. Active bacterial fungal or viral infection that affect the eye or cornea. ACUVUE OASYS contact lenses should not be used beyond their replacement schedule. Patients who use their contact lenses beyond the instructed guidelines risk causing severe eye issues such as corneal ulcers and worsened vision. Patients should avoid using outdated prescriptions when buying contact lenses. Prescriptions older than 12 months may need to be updated. CONCLUSION ACUVUE is considered by many to be the number one brand in the world. This is as a result of the established quality and comfort offered by its different products. ACUVUE OASYS lenses aren't any different. Users of ACUVUE lenses have a lot of positive reviews about the lens' performance. Advanced features in its designs such as HYDROCLEAR work together to ensure that patients enjoy a comfortable, moist and satisfying experience.